Messier 94 (also known as NGC 4736) is a spiral galaxy in the constellation Canes Venatici. It was discovered by Pierre Méchain in 1781, and catalogued by Charles Messier two days later. Although some references describe M94 as a barred spiral galaxy, the "bar" structure appears to be more oval-shaped. The galaxy is also notable in that it has two ring structures. M94 is classified as having a low ionization nuclear emission region (LINER) nucleus. LINERs in general are characterized by optical spectra that reveal that ionized gas is present but the gas is only weakly ionized (i.e. the atoms are missing relatively few electrons). In a paper published in 2004, John Kormendy and Robert Kennicutt argued that M94 contains a prototypical pseudobulge. A classical spiral galaxy consists of a disk of gas and young stars that intersects a large sphere (or bulge) of older stars. In contrast, a galaxy with a pseudobulge does not have a large bulge of old stars but instead contain a bright central structure with intense star formation that looks like a bulge when the galaxy is viewed face-on. In the case of M94, this pseudobulge takes the form of a ring around a central oval-shaped region. At least two techniques have been used to measure distances to M94. The surface brightness fluctuations distance measurement technique estimates distances to spiral galaxies based on the graininess of the appearance of their bulges. The distance measured to M94 using this technique is 17.0 ± 1.4 Mly (5.2 ± 0.4 Mpc). However, M94 is close enough that the Hubble Space Telescope can be used to resolve and measure the fluxes of the brightest individual stars within the galaxy. These measured fluxes can then be compared to the measured fluxes of similar stars within the Milky Way to measure the distance. The estimated distance to M94 using this technique is 15 ± 2 Mly (4.7 ± 0.6 Mpc). Averaged together, these distance measurements give a distance estimate of 16.0 ± 1.3 Mly (4.9 ± 0.4 Mpc). 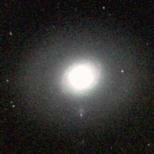 In 2008 a study was published  that appeared to show that M94 had very little or no dark matter present. The study analyzed the rotation curves of the galaxy's stars and the density of hydrogen gas and found that ordinary luminous matter appeared to account for all of the galaxy's mass. This result was unusual and somewhat controversial, as current models don't indicate how a galaxy could form without a dark matter halo or how a galaxy could lose its dark matter. Other explanations for galactic rotation curves, such as MOND, also have difficulty explaining this galaxy. M94 is one of the brightest galaxies within the M94 Group, a group of galaxies that contains between 16 and 24 galaxies. This group is one of many that lies within the Virgo Supercluster (i.e. the Local Supercluster). Although a large number of galaxies may be associated with M94, only a few galaxies near M94 appear to form a gravitationally bound system. Most of the other nearby galaxies appear to be moving with the expansion of the universe. ↑ a b J. L. Tonry, A. Dressler, J. P. Blakeslee, E. A. Ajhar, A. B. Fletcher, G. A. Luppino, M. R. Metzger, C. B. Moore (2001). "The SBF Survey of Galaxy Distances. IV. SBF Magnitudes, Colors, and Distances". Astrophysical Journal 546 (2): 681–693. doi:10.1086/318301. http://adsabs.harvard.edu/abs/2001ApJ...546..681T. ↑ a b c I. D. Karachentsev, M. E. Sharina, A. E. Dolphin, E. K. Grebel, D. Geisler, P. Guhathakurta, P. W. Hodge, V. E. Karachentseva, A. Sarajedini, P. Seitzer (2003). "Galaxy flow in the Canes Venatici I cloud". Astronomy and Astrophysics 398: 467–477. doi:10.1051/0004-6361:20021598. http://adsabs.harvard.edu/abs/2003A&A...398..467K. ↑ a b c d e f g "NASA/IPAC Extragalactic Database". Results for M94. http://nedwww.ipac.caltech.edu/. Retrieved 2006-11-09. ↑ Kepple, George Robert; Glen W. Sanner (1998). The Night Sky Observer's Guide, Volume 2. Willmann-Bell, Inc.. p. 51. ISBN 0-943396-60-3. ↑ a b J. Kormendy, R. C. Kennicutt, Jr. (2004). "Secular Evolution and the Formation of Pseudobulges in Disk Galaxies". Annual Reviews of Astronomy and Astrophysics 42: 603–683. doi:10.1146/annurev.astro.42.053102.134024. http://adsabs.harvard.edu/abs/2004ARA&A..42..603K. ↑ L. C. Ho, A. V. Filippenko, W. L. W. Sargent (1997). "A Search for "Dwarf" Seyfert Nuclei. III. Spectroscopic Parameters and Properties of the Host Galaxies". Astrophysical Journal Supplement 112: 315–390. doi:10.1086/313041. http://adsabs.harvard.edu/abs/1997ApJS..112..315H. ↑ C. Muñoz-Tuñón, N. Caon, J. Aguerri, L. Alfonso (2004). "The Inner Ring of NGC 4736: Star Formation on a Resonant Pattern". Astronomical Journal 127: 58–74. doi:10.1086/380610. http://adsabs.harvard.edu/abs/2004AJ....127...58M. ↑ J. Jałocha, Ł. Bratek, and M. Kutschera (2008). "Is Dark Matter Present in NGC 4736? An Iterative Spectral Method for Finding Mass Distribution in Spiral Galaxies". The Astrophysical Journal 679: 373–378. doi:10.1086/533511. http://de.arxiv.org/pdf/astro-ph/0611113v3. ↑ Battersby, Stephen (06 February 2008). "Galaxy without dark matter puzzles astronomers". NewScientist.com news service. http://space.newscientist.com/article/dn13280-galaxy-without-dark-matter-puzzles-astronomers.html. This page was last edited on 22 September 2009, at 10:18.